Broadcasted on November 3rd, 2014. Now it’s time to take a close look at a small but competitive business making a difference for the Korean economy. This week’s spotlight is on Droian Workstation LLC, recipient of a Best Design Award at the 2014 Korea Electronics Show. Eight products were honored with a Best Design Award, but the company that got the most attention at the trade show was unquestionably Droian Workstation LLC. Which one of its products amazed the world? Here’s Ms. Park Ji-yeon from its planning team to tell us about the awesome product. Droian Workstation LLC introduced its computer workstation at the 2014 KES. It’s not just any old computer chair. 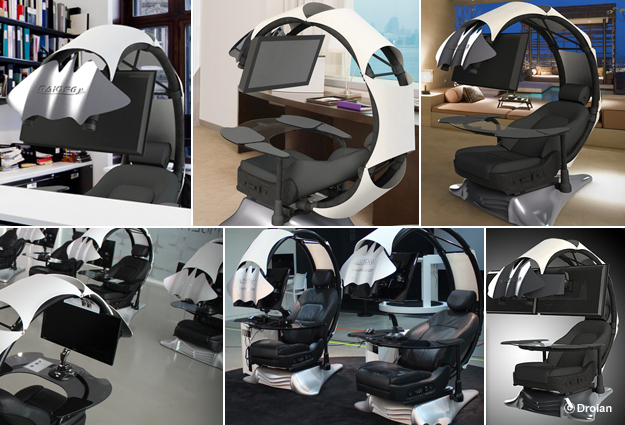 The Droian Workstation features a sphere-like working environment that reminds people of virtual reality, a comfortable reclining chair, and it has a monitor mounted on a frame, resembling stealth aircraft. There is also a clear tray attached to the chair where you can place a mouse and a keyboard, making you feel like you’re in a spaceship cockpit. This product is certainly awe-inspiring, judging from the responses at the recent trade fair. So how did Droian Workstation LLC come up with this awesome computer workstation? Our product name comes from the words “droid” and “an,” the end of the word “human.” The name is meant to illustrate the benefits it has for humans. Our CEO Sebastian Park personally came up with it. He’s a structural design engineer, who spends long hours in front of the computer. He realized that it was taxing on his body and uncomfortable to sit in front of the computer for a long time, so much so that he couldn’t concentrate on his work. So he began to think about how to dramatically improve the computer-using environment and came up with this product. The idea for the Droian Workstation got its start from a simple question of “How can I use the computer in a more comfortable position?” The company’s CEO and structural design engineer Sebastian Park, having experienced both physical and mental fatigue from long computer use, began working on this product in 2010. In the following year he completed the registration of a patent and established a company in 2012 to start developing the product in earnest. Many experts, including structural technicians, architects, and engineers, worked at the project for four years to introduce the Droian Workstation to the world. As a result, the computer workstation fulfills its original purpose of creating a pleasant and comfortable working environment for computer users. We focused on comfort and pleasantness. The product was designed to make computer work more comfortable. We made it so that the working environment, including the temperature, can be set to one’s liking. The motorized seat is designed to allow the back to recline 140 degrees, yet still keep the monitor right in front of a user, so the user can watch the monitor even when practically lying down. The seat is equipped with ventilation and heater adjustment switches and a keyboard tray that can be swerved to one side to allow for easy access. The unit is a combination of a motorized chair, a monitor mount, and a swerving armrest. Each part can be adjusted to fit the user’s position. This is the ideal solution for people who have to work long hours on the computer, such as office employees, computer programmers, and computer gamers. Now they can work in comfort without the risk of getting backaches and other spinal problems. In particular, this product opened a new paradigm for IT-integrated furniture by offering convenience, design, and innovation in one package. Encouraged by the positive responses gained at the KES, Droian Workstation LLC plans to expand to a larger market. Our goal is to make it into all countries that use computers. Many foreign buyers came to KES this year, because it’s Korea’s largest electronics fair. Buyers, especially those from Europe and the U.S., were highly interested in our product, thinking their customers would find the workstation really helpful. Because of their enthusiastic responses and negotiation offers, I believe our export outlook for next year is quite promising. We plan to enter markets in the U.S. and Europe. Meanwhile, the consumer market in China is growing fast. We met with a lot of Chinese buyers this year, that’s why we plan to do business in China as well. Droian Workstation LLC dreams of entering all the countries where computers are used. Perhaps one day we can see the employees of an innovative company like Apple working in the comfortable cocoon-like environment provided by the Droian Workstation.